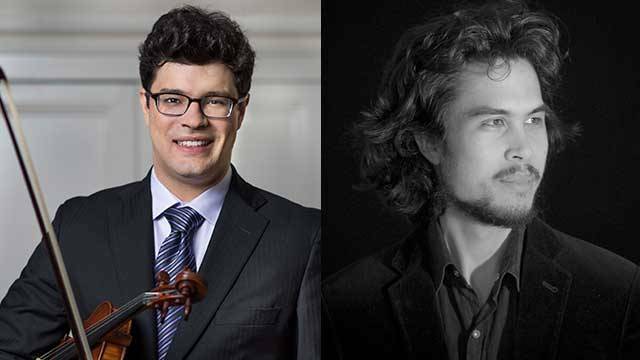 Violinist Domenic Salerni and Pianist Stephen Whale are featured in WVIA’s next live Simply Grand Concert to be held on Sunday, Sept. 24, 2017 at 3 p.m. in the Sordoni High Definition Theater at the WVIA Public Media Studios in Pittston, PA. Seating is free, but limited. Click here to reserve your seats. The program includes two well-known Violin Sonatas: the Debussy and the Brahms’ No. 3 in D minor. The duo will also play music by living composers: Toddler Riffs is a piece by Domenic’s father Paul Salerni, a student of Earl Kim, and long-time faculty member of the Music Department of Lehigh University; the Reflections Suite is a piece by pianist of the duo, Stephen Whale. 'Reflections' is a selection of pieces from an ongoing project: an album of fourteen pieces in each of the seven diatonic modes. These modes can be constructed using white keys in the piano starting on each of the seven notes. They range in color from bright to dark, so that each piece has a distinctive shade reflected in the titles such as 'Autumn Dusk' and 'Luminous memories'. Domenic Salerni is a native of the Lehigh Valley. He is currently first violinist of the Dalí String Quartet, and was formerly the first violinist of the Vega Quartet, string-quartet in residence at Emory University. He is on faculty at ArCoNet and the Dalí International Chamber Music Festival, and is also a member of the Foundry septet, which promotes the music of Andy Akiho, and which was a Finalist and Laureate ensemble in Open Division of the first inaugural 2016 M-Prize. Domenic has given master classes at Lehigh, West Chester, Augusta State, and Kennesaw Universities, Franklin Pond Chamber Music Festival, and the Atlanta Music Project. Learn more about Domenic at www.daliquartet.com and www.foundryensemble.com. Stephen Whale’s artistry has been hailed as being ‘from the heart…always with his formidable technique used to further the essence of each composer’ (Patrick Thomas, Australian broadcaster and conductor), ‘sensational’, ‘jaw-dropping’ and ‘at the top of his game in his generation’ (Performing Arts Monterey). Originally from Sydney, Australia, Whale has appeared at festivals such as Bergen International Festival, Norway; Kuhmo Chamber Music Festival, Finland; the International Holland Music Sessions, The Netherlands. Based in New York City since 2014, he was appointed Principal Artist for L’Archet Concert Group for the 2015–16 season, where he performed solo and duo recitals at Cohen Hall, East Stroudsburg University, PA. He has also performed on the Vaughan Recital Series at Dartmouth College. In Australia, Whale has performed with the Queensland and Sydney University Orchestras. Whale is currently undertaking the DMA program at the Graduate Center, City University of New York, where he was awarded the GC Chancellor's Fellowship. He holds degrees from Yale University, Sydney Conservatorium and a diploma from Grieg Academy, Norway; his principal teachers have been Boris Berman, Natalia Sheludiakova, Thomas Sauer and Audun Kayser. Stephen is currently teaching music theory, ear training and keyboard harmony at Aaron Copland School of Music (Queens).